Acute cystitis is the medical term for a bladder infection, most often caused by a bacterial infection. This is the most common cause of what is generally known as a urinary tract infection. It affects up to 10 million Americans a year, mostly women. About 40 percent of women at some time during their life will have a bladder infection, and many will have multiple episodes. 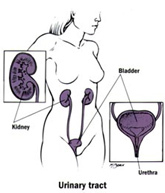 Being a woman: This is the most common risk factor, because the female urethra (the tube that connects the bladder to the outside of the body) is very short, allowing germs an easier entrance to the bladder. Frequent urination, often of small amounts. A very strong urge to urinate. Urine that has a strong odor or is cloudy. If you experience any of the above symptoms, regardless of your gender, see your doctor, who will most likely examine you as well as your urine. If you do have an infection, your doctor will prescribe an appropriate antibiotic. If deemed necessary, a sample of your urine may be sent to a laboratory, where it will be further tested to identify the type of germ to determine which antibiotics would work best. The most common bacteria identified is E. coli, which is commonly found in the human intestine. There are at least a half-dozen antibiotics that are commonly prescribed for this. This drug Uristat can now be purchased over the counter and can be useful for treating your symptoms before you see the doctor. Be aware that it will turn your urine a dark orange color. Many people believe that drinking cranberry juice will help cure a bladder infection. Cranberry juice does not help treat an active infection. It only helps prevent infections in those who get them frequently. There is a chemical in cranberry juice that prevents bacteria from attaching to the inner wall of the bladder, which will prevent the infection from beginning. Those who rely on cranberry juice to treat an infection are only delaying proper treatment with an antibiotic. If a bladder infection goes untreated, it could worsen and even spread to the kidneys, causing a more serious kidney infection. Drink enough liquids to flush the bacteria out of the bladder. Drink more than you feel you really need to. Avoid a full bladder, and empty the bladder whenever the urge is present. Practice good hygiene. “Wipe from front to back,” and wash the skin around the genital area daily. Change sanitary pads and tampons frequently. Avoid bubble baths, which can irritate the urethra and mimic an infection. Fortunately, bladder infections are not usually serious if recognized and treated in time.